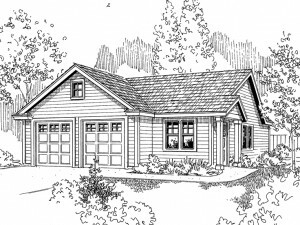 Traditional styling allows this 2-car garage plan with flexible space to blend well with most homes. The exterior features a siding façade and a covered porch. Two overhead doors open to the double garage where bays 27’ deep easily accommodate larger vehicles like pick-up trucks and SUVs. Windows at the back of the garage lend natural light and a service door provides convenience. The flexible space attached to the garage can be used for a multitude of purposes. This small studio features a full bath and ample closet space. It could serve as a guest suite for weekend visitors providing privacy from the main home. For those who work from home or own their own small business, the flexible space could serve as an office allowing you to go to work and never actually leave home. Finally, crafters, artists and music enthusiasts might choose to finish the flex space as their own private studio for whatever hobby they prefer. Add functionality to your home and extra parking space too with this 2-car garage plan with flex space. 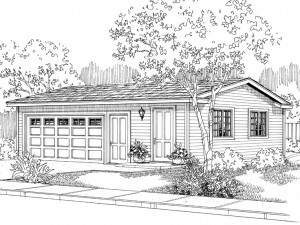 For more garages like this one, please view our collection of garage plans with flex space. If you’ve decided you want to build a new detached garage, chances are you probably have a general idea about the type of garage you want to build. Our simple search tool and our advanced search tool can help you find garage plans that will meet your specific criteria. Simply enter your required features and criteria and the website will do all the work for you. By using either search tool, the website will narrow down the possible choices and display only those that include the specific criteria you selected. TIP: When entering your search criteria consider the overall dimensions of your lot and enter a width and depth that will fit on your lot. Likewise if you are looking for special features such as a loft or living space, choose the appropriate garage plan style. In some cases you may find a garage plan that is close to what you need, but it isn’t quite perfect. If you find a garage that satisfies the majority of your needs, you can complete and submit a modification request form to get a free quote for the changes you will need to make your selected garage plan perfect. Our modification team will provide a quote within a couple of business days. At that time, you’ll also receive information about ordering plans with your specified modifications should you decide to move forward. 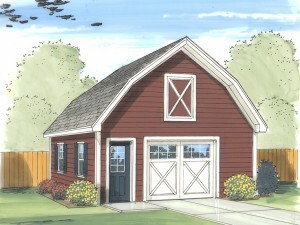 Add functionality and value to your home with this 2-car garage plan with flex space. On the left, an overhead door opens to the 2-car garage delivering 462 square feet of unfinished parking space, ideal for two family vehicles, or maybe one vehicle and a pair of ATVs it is sure to protect your investments from the elements. A front entry service door adds convenience. On the right side, a separate office works well for a home based business or the work-at-home-parent who needs a little privacy but doesn’t want to go far from home. The office provides 198 square feet of finished space and features a separate entry. It is flexible enough to serve as a hobby area, exercise room, storage space or even a rec room if you prefer. This flexible, detached garage offers sheltered parking and storage or finished space for whatever you might need. Learn more details about plan 051G-0014 now! So, you’ve found just the right detached garage plan to accommodate your needs, except there is one small problem. You’d like to have a practical and convenient drive-thru bay, but the floor plan you like doesn’t offer front and rear overhead doors. No worries. While The Garage Plan Shop offers a collection of drive-thru garage plans, but we understand that we might not offer the perfect garage floor plan to satisfy all your needs. However, if you find another garage plan in our collection that is ideal for your needs and would be perfect if it had a drive-thru bay, just let us know. We offer a modification service who can modify the floor plan according to your specifications. Simply submit your modification request form to receive a free quote to add an overhead door to the rear of the garage you like most. Our modification team will provide a quote within 1-2 business days to make the change for you and they will explain the modification process. Just click on the “modify this plan” link below the main image of the garage on the plan page of our website, complete the form and return it to us to receive your quote. In just a few weeks or less, an ordinary detached garage design will be transformed into a practical drive-thru garage plan. 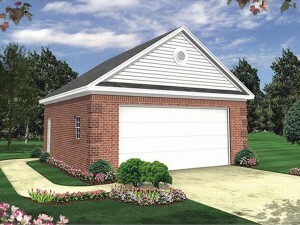 Just like home plans, detached garage plans are available in a wide range of architectural styles. This diverse selection of styles ensures you’ll find a garage plan, carport or shed plan to blend with the architectural style of your home. 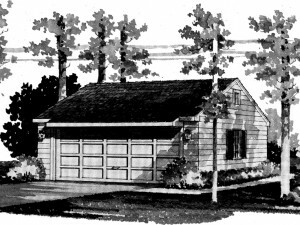 Below is a list of many of the architectural styles represented in The Garage Plan Shop’s collection of detached garage plans and other structures. When you are choosing a detached garage plan, keep in mind the architectural style of your home and its surroundings to ensure your new garage will complement your home.